Are you looking for a sweet, crispy, gooey, and protein packed treat that can be enjoyed any time of the day? 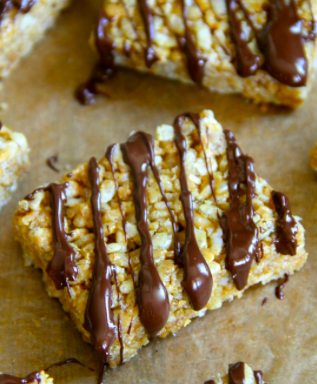 These Protein Rice Krispie Treats are absolutely delicious! They are vegan/gluten-free/refined-sugar free and only take 30 minute to prepare! Optional: 2-3 Tbsp. chocolate chips, for drizzling. 1. Prepare a 8×8 baking pan by spraying it with cooking spray. Set aside. 2. In a medium-sized bowl, combine the cereal and protein powder. Set aside. 3. In a small pan over medium-high heat, add nut butter, coconut oil, and brown rice syrup. Bring to a boil, stir frequently to avoid burning, remove from heat and cool slightly. 4. Pour nut and syrup mixture into the cereal mix. Stir until everything is fully combined and all the cereal is well coated. 5. Transfer to prepared baking dish. Spread the mixture evenly in the pan, pressing down firmly. 6. Place chocolate into a microwave safe bowl and microwave on high in 20 second intervals, mixing between each. When chocolate is fully melted, drizzle over the top of the packed cereal mixture using a spoon. 7. Place pan into fridge and allow to cool for ~30 minutes before cutting into squares. Contact us for injury management or online health/training/nutrition plans.